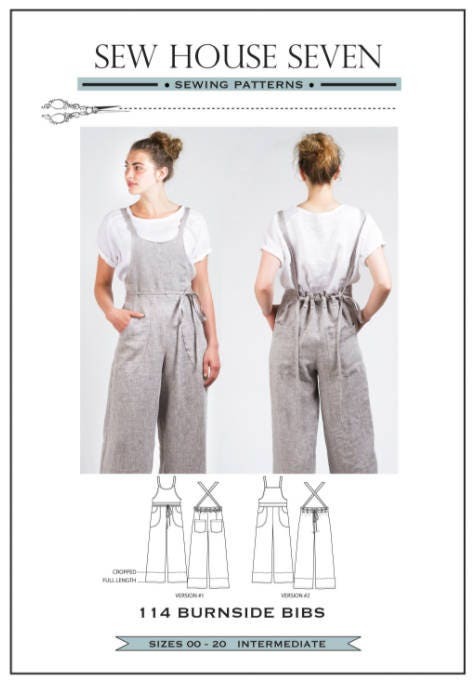 "The Burnside Bibs are not your traditional work overalls. Yes they are comfortable and easy to wear, yet they are much more stylish and feminine than traditional versions. The straps that transition to narrower ties offer many options for how they can be tied. And...like so many sewing patterns, we as sewists are able to influence how casual or dressed up they become simply by fabric choice. Choose a fabric with some drape such as Tencel and pair them with a silk blouse and some heels for a dressed up look. Use a more traditional denim or linen and wear them with a tee shirt, sneakers or clogs and take a more casual approach. This is an intermediate level pattern. Sizes 00 - 20"